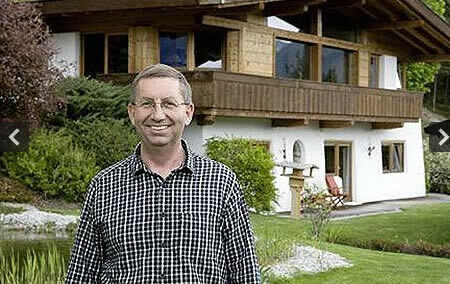 Karl Rabeder grew up poor and thought that life would be wonderful if he had money. But when he got rich, Karl discovered that he was more unhappy, so he decided to give away every penny of his £3 million fortune: "My idea is to have nothing left. Absolutely nothing," he said. "Money is counterproductive – it prevents happiness to come." On the block, or already sold, is his luxury villa with a lake in the Alps, his 42-acre estate in France, his six gliders, and the interior furnishings and accessories business that got him rich in the first place. Instead, he will move out of his luxury Alpine retreat into a small wooden hut in the mountains or a simple bedsit in Innsbruck. His entire proceeds are going to charities he set up in Central and Latin America, but he will not even take a salary from these. Most people return from Kenya with photos of giraffes and lions, and tales of their time on safari. But one millionaire has come back with the title of elder of a Masai tribe. Graham Pendrill is the first white person to gain such an honor from the group after solving a potentially violent inter-tribal dispute while on a month-long trip to the East African country last year. During the official ceremony, Mr Pendrill had to drink bull's urine and had a cow sacrificed in his honour. 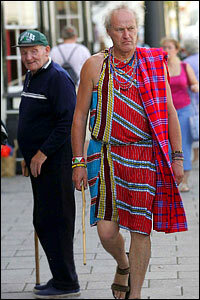 Since returning, he has worn his Masai clothes while going about his business in his home town of Almondsbury, near Bristol, UK. The 57-year-old bachelor, who was given the tribal name Siparo meaning 'brave one', often wanders down his local High Street wearing nothing but a robe and sandals. 'People can call me eccentric - it doesn't bother me,' he said. 'When I got home my ordinary clothes just felt odd. 'I've had some sideways looks and a difficult moment in a Bristol pub, but most people are polite,' he added. Mr Pendrill, an antiques dealer, has given his suits to Oxfam and plans to sell his £1.2million mansion so he can move to Kenya to live in a mud hut with the Masai later this year. 'I've developed a huge respect and affection for the people there. It's a real honour to be an elder,' he said. 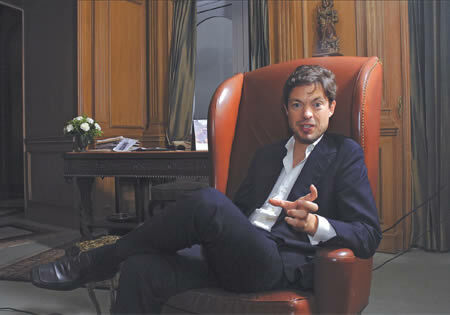 Meet Nicholas Berggruen, a homeless billionaire. You read that right. Nicholas is worth billions but doesn't even own a home (he stays in hotels) because he's lost all interest in acquiring things. 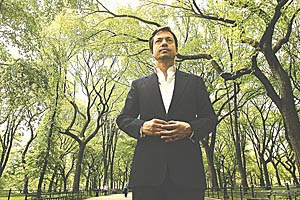 After making his billions, Mr. Berggruen, 46, lost interest in acquiring things: They didn't satisfy him, and in fact had become something of a burden. So he started paring down his material life, selling off his condo in New York, his mansion in Florida and his only car. He hatched plans to leave his fortune to charity and his art collection to a new museum in Berlin. For him, wealth is about lasting impact, not stuff. Forbes magazine estimated Berggruen's net worth at $2.2 billion as of 2010. So, there we have it, straight from the horses mouth. Money cannot buy happiness.